The Prince of Charm, Andy Tauer, came by for a visit Thursday evening. He brought his partner Werner (pronounced Verner) with him. I was so enchanted that I forgot to document the visit with pictures. When I did remember, the affair felt way too sacred for a camera. In fact I contemplated not posting about it and holding the memory close to my heart. Andy and Werner arrived here at our little tree house-like abode at 5pm. 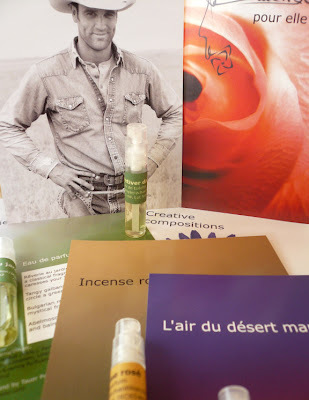 I was gifted with one of the new Tauer Perfume sample packs, shown above. We began the evening with a toast with some jasmine sambac hydrosol. Then I invited them to my studio for some sniffing. Werner declined on the sniffing and choose to hang with Greg and the fresh guacamole. Meanwhile, I took Andy on an olfactory adventure through each of my fragrances. As he inhaled each individual perfume, from a freshly dipped scent strip, I noticed that he looked perfectly poised like a ballerina. He stands very erect, as if in second position, and becomes completely devoted to the experience of taking in the scent molecules being offered to him. 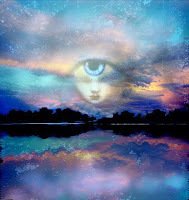 That was when I wanted to snap a picture, but, I was also extremely conscious of the sacredness of that moment. During the sniffing he asked lots of great questions and seemed most intrigued by Q, Chaparral Vera and Sierra. In fact Sierra was his favorite of the seven he experienced. He asked how could it be that I use up to 50 different ingredients in one perfume. Thus, I shared a few of the accords that go into Sierra, explaining that each accord can have up to ten ingredients in each one. Andy does not formulate using accords in fact he refers to them bases. He shared that perfumer Vero Kern uses some of this accord methodology. We probably could have spent the entire night in my studio talking perfume and formulation. Greg came in at one point and reminded us that the guacamole was almost gone, as well as the light. From the house the adventure weaved its way deep into the Santa Monica Mountains just as the sun was starting to go down. The view and quality of light was quite fantastic. The sunlight was being filtered through the pink colored clouds to produce a very surreal and magical landscape. An image I don't think any of us will soon forget. After our walk we served dinner, followed by dessert and more fragrant journeys. This time we sniffed a variety of ingredients found in my palette. It was fun to introduce Andy to precious essences he had not yet experienced, like Mitti and a co-distillation of Vetiver and Rose. It was also interesting to compare and contrast our tastes. The other item Andy was curious about in my perfume formulation was the process of tincturing. The evening then turned from the olfaction to visual & auditory. Andy and Werner were taken to Gregs world, where visual art reigns supreme. This time it was Greg's turn to enchant with his new film reel and award winning illustrations. The Andy and Werner duo are here in California for a few weeks. This past Saturday Andy appeared at The Scent Bar where he will present again on October 17th. For now they are off to the peace and tranquility of L'Air du desert. 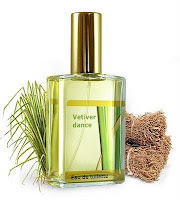 I've been on a high dancing with Andys latest fragrance, Vetiver Dance. It is a stunning and beautiful perfume. He managed to tame vetiver essential oil, which has a tendency to get very heavy and prominent in formulas. Vetiver is one of those notes that is extremely viscous and not necessarily "friendly", a tricky one to manage. Andy expertly choreographed vetiver to dance fluidly in the composition of this fragrance. 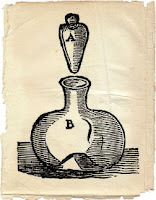 I am most enchanted with the Ambergris note, is it real or married with the synthetic ambriene? Either way, it is a luscious, velvety note that floats up through the dance as the vetiver diminishes. Read more about Andy's new fragrance at Perfume Shrine. Images: Top is a photo I took of Andys perfume sampler gift, Face in the Sunset image© Greg Spalenka, Alchemical bottle on parchment©Roxana Villa and Vetiver Dance image is from the Lucky Scent website. We did have a grand time, wish we could have manifested even more time. Yes, finally met the W-factor, in flesh and blood. He appeared quite fond of my cooking.